But the funny thing is, when you study American history, you learn that things didn’t seem inevitable for people at the time and that it wasn’t all that certain. Today, we wonder if the republic will survive the problems we have today—terrorism, racial divisions, massive debt, crumbling infrastructure, failing schools, the list goes on. We worry that this could be it… that the path we are on now could lead to the ultimate demise of the country. And while many of these concerns are legitimate and leave us feeling very unsettled… when we study our history, we find that this unsettled, unknowing feeling has always been there for America. At no point in our history did we ever feel totally secure or that a prosperous future was guaranteed. And many times we felt that we were right on the precipice of monumental success or epic failure. There is one event, in particular, that I will focus on in this episode. It’s an event of critical importance to our country and the world; without which we may never have become a world power. It’s a story that challenges our historical bias towards inevitability and the very meaning of what it means to be an American. It involves four of our presidents, all of whom played indispensable roles in this story. It involves a great deal of trickery, deception, and spur-of-the-moment decisions. And it’s a story with enormous implications for the world today. That story, the Louisiana Purchase, is the subject of this episode of This American President: The Art of the Steal. If you want to learn more about today’s episode, check out Thomas Jefferson: The Art of Power by Jon Meacham, Jefferson’s Great Gamble by Charles Cerami, and James Madison: A Life Reconsidered by Lynne Cheney. This American President is produced by Richard Lim and Michael Neal, with help from Jennifer Steinhoff. The music in this episode is by Blue Dot Sessions. 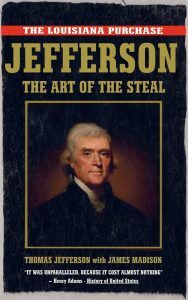 The “Art of the Steal” image was created by Juliet Swanson.